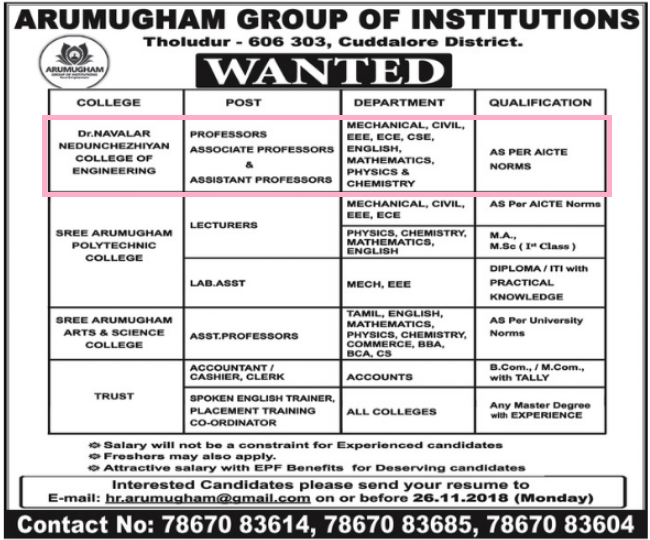 Dr. Navalar Nedunchezhiyan College of Engineering, Cuddalore has advertised in the DINAMALAR newspaper for the recruitment of Professor / Associate Professor / Assistant Professor jobs vacancies. Interested and eligible job aspirants are requested to apply on or before 26th November 2018. Check out further more details below. About College: Dr. Navalar Nedunchezhiyan College of engineering was founded and being promoted by the philanthropic and charitable organization namely Arumugha Mudaliyar Sornam Educational Trust, Tittagudi. This college has been approved by the AICTE, New Delhi and it is affiliated to the internationally famous Anna University, Chennai.